Starting a website or blog is not just the beginning of an incredible online business but more than that. Yes, it is a process of unlocking your unlimited potential by which you can diversify your skills and start generating a huge income. Of course, it requires some efforts and strategies along with investments in skills, smart-hard works, and learning attitude. But apart from these you also need to invest some money in buying stuff like a good domain name and web hosting. But selecting an ideal web host among various most trusted and best web hosting services available is a tough task for beginners. I have already discussed some great tips for selection of a perfect domain name for profitable online business from some of the best domain registrars to buy cheap domains. But when it comes to web hosting, you need to look for the best web hosting service provider which you can trust on. Overall, it’s not only about your hard earned money but also about making your website rock. So in this post, I’m sharing a list of most trusted and best web hosting services which are worth your money. Why Do You Need Web Hosting Service? Which Are Most Trusted and Best Web Hosting Services? When you create web pages on your website or blog, those files need to be stored safely so that on users demand they may be connected to web servers to make those web pages available. Though you yourself can host your files in the same way as your computer’s or laptop’s hard drive host many files. But to do this practically, you need a very powerful internet connection which may connect those files to the web servers instantly on users request to show them. Since doing this practically from your home server is impossible. So you need a web host company who can manage all these stuff with unlimited bandwidth and space. And you can hang out with friends during weekends. Therefore, you need best web hosting service provider that manages all your files and look-after every folder of your blog or website. Buying a web hosting is sometimes considered as buying space because practically you are buying space to host your files. Though there are many companies available in the market who provide best web hosting services at a very low price. Even some of them offer free web-hosting. But I recommend to go for a high quality, trusted and best web hosting service provider. Because as your website grows, your web hosting service provider plays a crucial role in uptime and better management of your websites. Therefore, I have selected some very trusted and best web hosting service providers to make it easy for you to choose the best one out of them. Best because of course you want to be the best and trusted because your files are important for you. So if you are going to allow someone to manage those files, they must be trusted and reliable enough. Bluehost is undoubtedly one of the best web hosting service providers who are powering over 2 million websites worldwide. It offers various hosting packages for you. The hosting packages include shared hosting, WordPress managed hosting, VPS hosting and hosting with dedicated servers. But if you are going to start a new blog, the shared hosting is best for you. Though the various available video tutorials and guides make it easy to resolve your any problem. Adding bread to the butter, Bluehost has an excellent 24×7 customer support service to help you technically. So you don’t have to worry if ever you struck and needed technical help. If you want to run your blog on WordPress, BlueHost is the best hosting service provider for you. In fact, they offer 30 days money back guarantee also. So try it now and if you didn’t like their services just cancel and get your money back with their refund policy. 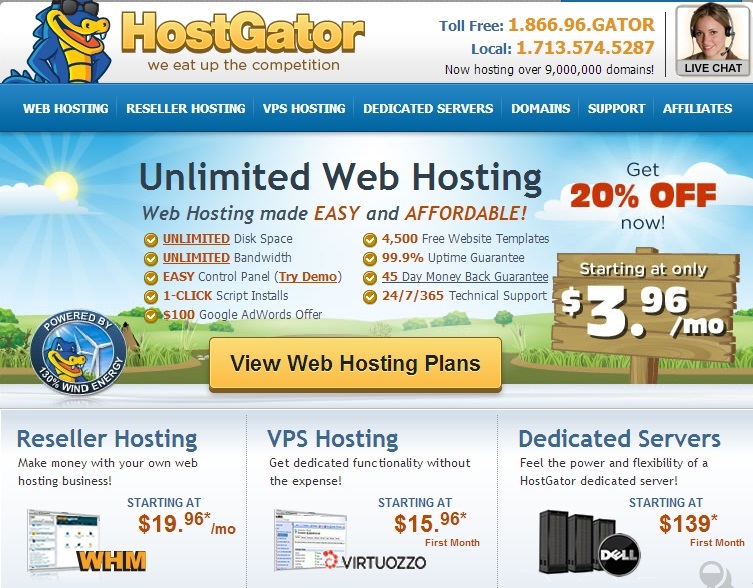 HostGator is another best web hosting service provider which you can trust on. It was my first choice until my traffic increased and I started facing problems with their shared hosting. Though now my first choice is Bluehost, I still recommend for HostGator as they offer very quality hosting services at low prices. Also, there has been a huge increase in the popularity of Hostgator in last few years. And probably one common reason for that is their many promotional discounts and coupons available. They offer many services like shared web hosting, reseller hosting, VPS hosting, dedicated servers hosting, applications hosting, and windows hosting. If you wish to run your blog, shared hosting is perfect for you. They have a very robust 24/7/365 customer support toll-free service or live chat support which is helpful in technical stuff. HostGator offers 45 days money back guarantee. But I bet you would never like to get a refund because their top quality best web hosting services and that is why they are one of the best hosting service providers who are very trustworthy also. DreamHost is one of those the best web hosting service provider which is known for its quality service over last 17+ years. It has been winner of PC Magazine’s Business Choice Award for best web hosting service. DreamHost offers various types of hosting services like WordPress hosting, shared hosting, VPS and dedicated servers hosting, etc. They also offer a free domain name with web hosting services. If you are looking to run a blog, their shared hosting is the perfect solution for you. The 24/7 in-house support via email, live chat, and Twitter is really awesome (though I have not tried to contact ever yet I have learnt from other users in forums discussions). Though price is comparatively higher but 100 % up-time feature ensures this is worth your money. And if not satisfied, you can get your money back as DreamHost offer 97-day money back guarantee. WP Engine is yet another popular name in the list of trust worthy best web hosting service providers. Some of the top businesses are running on WP Engine hosting. WP Engine provides premier managed WordPress services with fastest and most reliable secure hosting. Though I never recommend this hosting service for small bloggers or websites. One simple reason is that price is quite higher as compared to many other hosting services. And more importantly, you don’t need managed WordPress hosting in your initial days. But if you have a well-established site with high traffic, more data and enough budget, you must consider going for managed WordPress hosting from WP Engine. WP Engine hosting service has got positive words of a large number satisfied customers worldwide. One advantage of choosing WP Engine is that you have freedom to choose your desired plan based on many visitors your site is getting. Customer support service is excellent, and they also offer risk-free 60 days money back guarantee. iPage is one of those best web hosting service provider about which I came to know a few months back. iPage is a top-rated hosting service provider in the USA, and it is serving around 1,000,000 customers. iPage has a good reputation in providing best web hosting services like essential hosting, WordPress hosting, dedicated hosting and VPS hosting. If you are looking to run a blog, I would recommend going for the essential hosting of iPage. Sometimes the exceptionally low price threatens me of its quality of service. But I contacted some of the users who are running their site on iPage hosting, and was surprised that they recommended me for iPage. 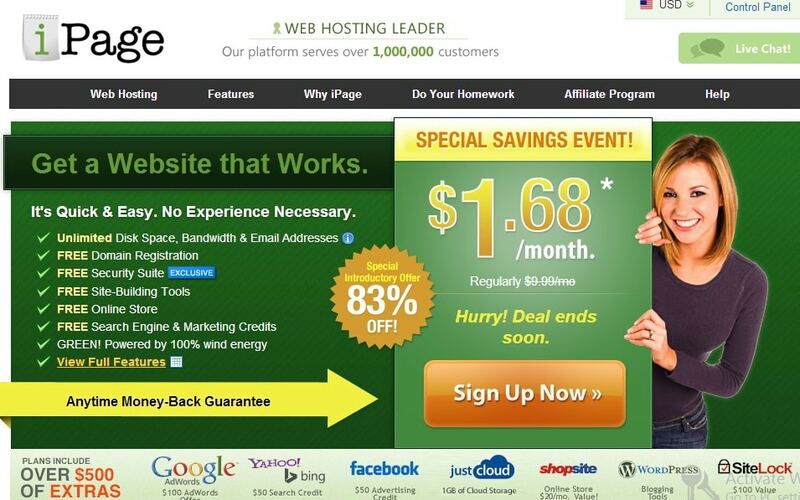 With 99.85% up-time with a cheap price tag, iPage hosting is awesome. Though there were some issues with iPage web hosting but that was only three times in last few years. So that is affordable, considering they also provide many other extra coupons and services included in the same price. However, anytime money back guarantee unbelievable. Though there are some other web hosting services like GoDaddy and BigRock are getting popular these days. But I recommend above 5 as most trusted and best web hosting service providers. However, while choosing a trusted and best web hosting service, try to prefer quality over cheap prices. Because sometimes, costlier stuffs are more than worth your money. Was this list of “trusted and best web hosting service providers” helpful ? Share with your friends they too might find it helpful. Hope you enjoyed this post. However, do let me know which of these you think as best hosting service provider? Also, your any experience or query about above hosting services is highly appreciated in the comment box below. Nice share. These 5 web hosting providers are really most trusted ones. Bluehost is my personal favorite. Thanks for taking time to drop a comment. Thanks for sharing..! Well, choosing the best hosting service for our blog is really important for online business. Actually, I love Ipage since I am currently using that. I found that it is a bit slow but when I upgraded to WP essential the speed is much better now. I love that. Thanks for taking time to drop a comment and I really appreciate the way you shared your personal experience about iPage hosting with our valuable readers. However, I would like to ask from my readers perspective whether iPage hosting has any disadvantage that you don’t like ? Previous: How Much Does It Cost for Building Top Quality Apps?